… from a Victorian perspective. In 1893 The Strand Magazine published a bizarre article by W. Cade Gall. It claimed to record the dream of a snoozing gentleman in which he read a history of fashion written in 1993. 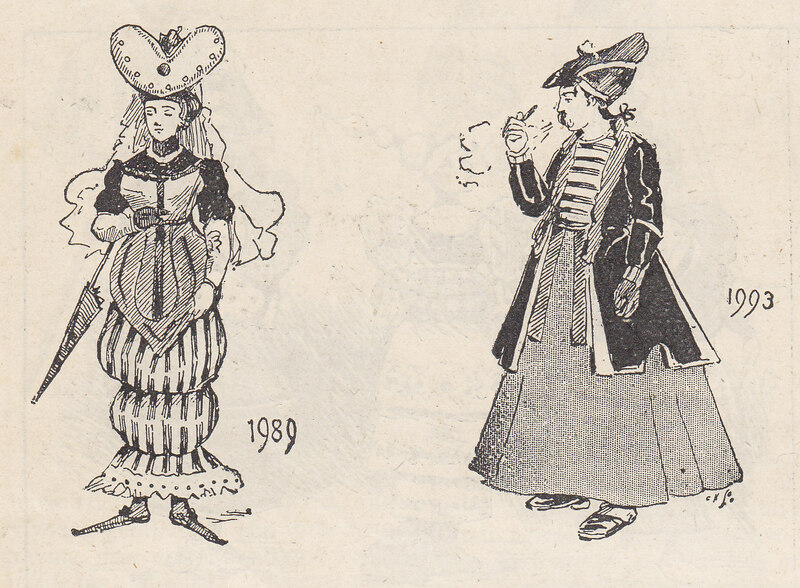 This mock history explored the absurdities of fashion’s evolutions, complete with zany illustrations (all featured in the article). 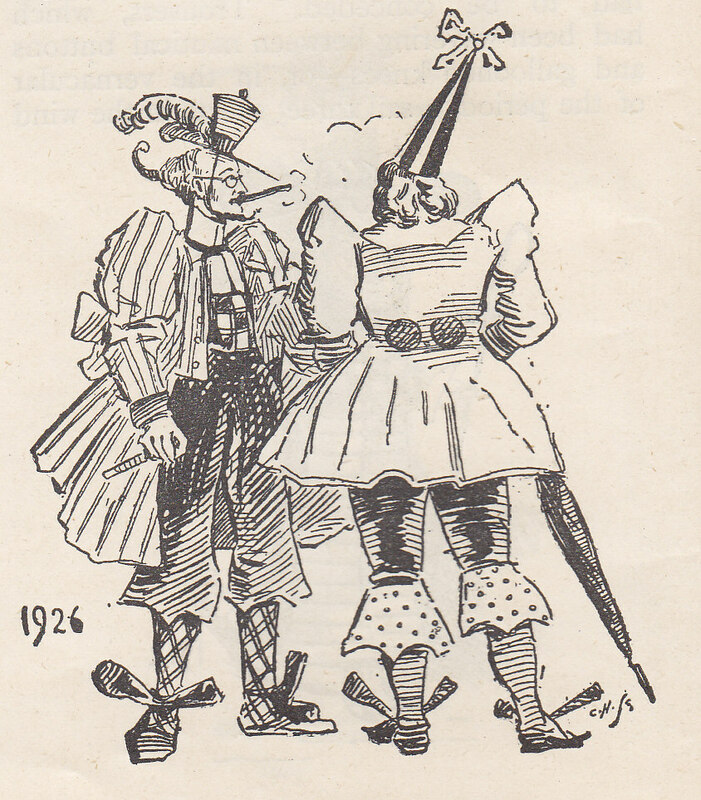 The true delight of the piece isn’t so much in the flamboyant costumes depicted. Nor is it quite in the squirm of superior knowledge a modern reader might feel comparing predictions with reality. The real pleasure is in turning the spotlight on our own preconceptions. Any culture struggles to see outside its own social and technological norms. We assume that what we wear and how we wear it are ‘natural’ and inevitable even. There are strong often-unexamined beliefs about the ‘correct’ gender of clothes, and also what’s appropriate for a certain status, profession or religion. In 1893 it was inconceivable that men would leave off neckties, shirts and jackets. Or that anyone could go out hatless. That clothes would fit sleek to the body. That legs would become a new erogenous zone. That corsets would shrink first to girdles, then bras; that women’s drawers would become so scanty they disappear between the rump cheeks. As for fabrics, the late nineteenth century saw early developments in cellulose fabrics leading next to rayons – ‘art silks.’ Until DuPont’s work with fully artificial fabrics in the 1930s and the invention of nylon, the only way to form-fit fabric was through rubber elastic, or clever bias-cutting. The late 20th century has seen a dazzling surge in textile innovations. Garments made of Kevlar, Gore-Tex, PVC, Mylar etc have expanded the range of enviroments and scenarios in which humans can survive and thrive. All very Space Age. But I can’t help wondering what a fashion history of our lifetimes would reveal about our clothes. Will we be admired for wearing digital prints, spray-on fibres and ‘intelligent’ weaves… or will we be ridiculed for our conventionality, impracticality, informality and over-consumption? I look forward to finding out in the future.